TARPON SPRINGS, Fla — Fisherman and folks with Bonefish & Tarpon Trust are working to get Tarpon out of a pond in Tarpon Springs. The pond is being drained and leveled for new apartments. The oxygen level is low making it hard for the fish to breath as nutrients at the bottom swirl around. But they can’t get to the fish when the water level is high. 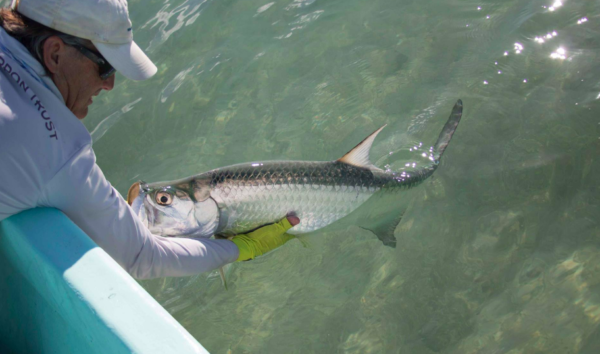 “The less water that there is, the easier it is for us to get the fish,” said JoEllen Wilson, the Juvenile Tarpon Habitat Program manager at Bonefish and Tarpon Trust. “I think we’re really going to have to wait for the water level to drop,” said Gian Dibella, a local fisherman. It’s a waiting game for these folks as they work to save the juvenile Tarpon, but they say it’s worth it. “If we can save one and spare its life and allow it to grow up and be the next breeding stock, then we’ve succeeded,” said DiBella.